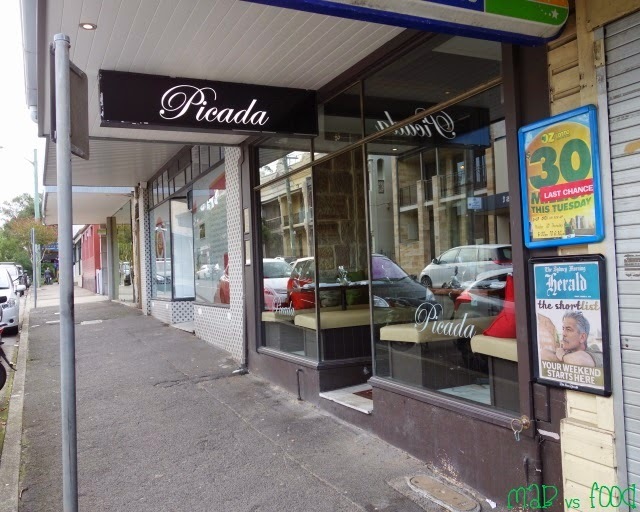 Located conveniently near Balmain East Wharf is a new restaurant, Picada. Picada is opened by 2 chefs who worked previously at the 1-hatted restaurant Catalina, Vladimir Alemany and Roberto Araneda. Picada serves modern Australian food using flavours from their Latin American heritage. Picada is located in a great spot for a date night. It's far enough away from the hustle and bustle of the CBD, but still a synch to get to. 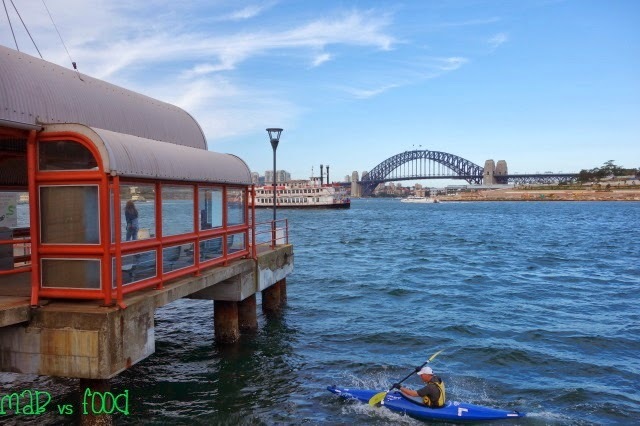 Just hop on a ferry from Circular Quay or Darling Harbour and you can enjoy a nice ferry ride across the harbour with some great views, which is something that I often take for granted being a Sydneysider. 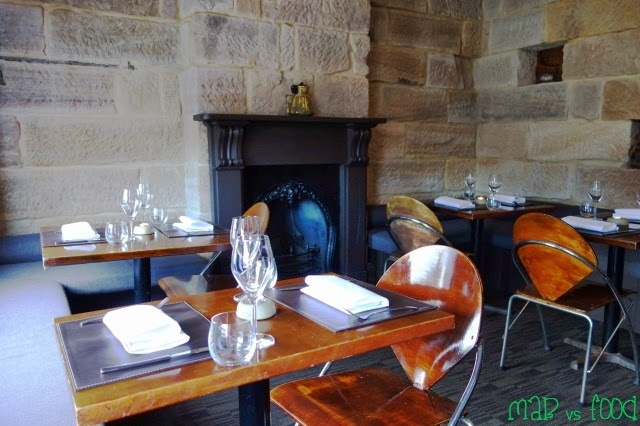 Picada is located in a heritage listed building on Darling St. The trek to the restaurant is on an uphill slope; just be thankful that the walk to the ferry after dinner is downhill :) There are two dining rooms at Picada and my wife and I were taken up a narrow, steep staircase to a small, cosy room that could barely fit 8 tables or so. It turns out that this is the room where they are putting all the "voucher diners". We came tonight with a voucher from Ouffer that gave us a 3-course meal each for $49 ($119 value according to the voucher). This is amazing value, in anyone's book! The menu at Picada consists of a large range of entrees and a much more compact offering of mains, sides and desserts. Instead of going down the traditional 3-course path, ordering a number of these entrees and having them as tapas is definitely a good option. 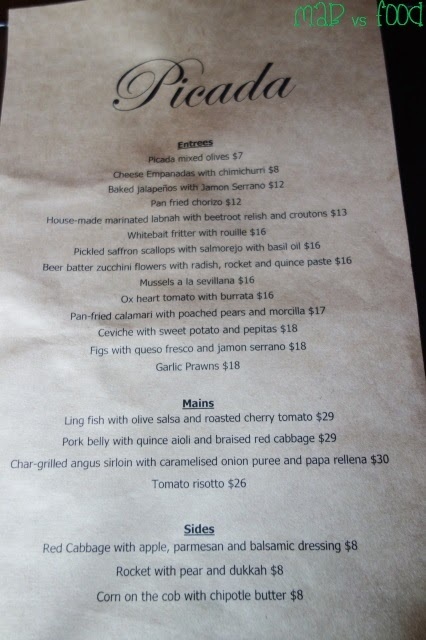 As most of the menu consisted of dishes that had something written in Spanish, and given my limited knowledge of South American cuisine, our waitress practically had to explain the entire menu! She was more than happy to oblige and was friendly and helpful, definitely making it easier for me to decide what to order. Our waitress did explain to us as we were dining on the Ouffer voucher, the ceviche and the garlic prawns are excluded from the menu. Anything else was fair game. We did encounter a little mishap at the end, more about this later. To start off the evening, we were offered gazpacho as a starter. 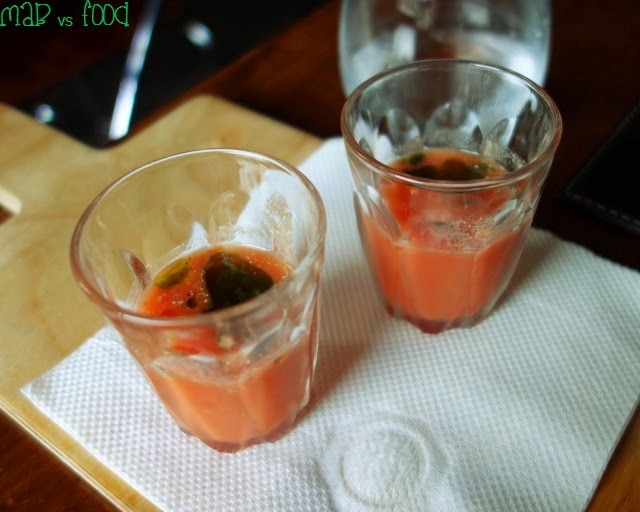 Chilled gazpacho is always a refreshing way to start off any meal, with tried and tested flavours of tomato and basil. The pepperiness of this gazpacho did catch me a little bit by surprise though. I chose this entree because I was intrigued by the pickled saffron scallops, something that I haven't seen before. What I enjoyed about this entree was that it tasted fresh and refreshing, livened up my taste buds and left me salivating for the next course. The pickled scallops were interesting and quite pleasant with its distinct flavour of saffron and nice amount of acidity. I had no idea what salmorejo was initially, but it is a puree made from tomato, bread, oil, garlic and vinegar. 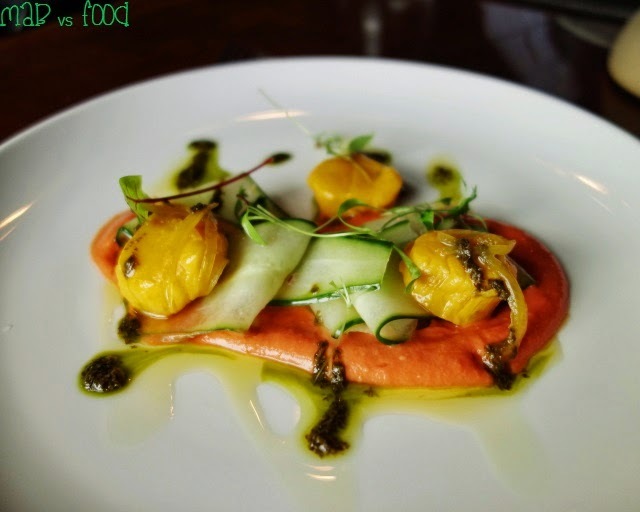 It tasted a lot like the gazpacho I had for starter, especially with the basil oil, but I wasn't really complaining since I am a self-confessed tomato addict! My wife opted for the ox heart tomato with burrata for entree (the other vegetarian "more substantial" choice were the zucchini flowers). Yep, more tomato. And more basil. But the star of this dish is the burrata, which was, to our surprise, crumbed and deep fried! The innards of this crisp ball of cheese, was warm, creamy and stretchy. So delicious and so evil! The main selection was concise with a fish, a beef, a pork and a risotto dish. I went for this main not for the sirloin but for the papa rellena, another item that I had never heard of. Our waitress explained that it is a Peruvian dish consisting of mashed potato with gooey cheese inside, which was rolled up into a ball, crumbed and deep fried! It turns out this was the star of my dish. You will be in for a treat, as long as you are not on Weight Watchers! As I always do, I asked for the steak to be cooked medium-rare. It was more medium than medium-rare, but sirloin was well-seasoned and had great flavours. 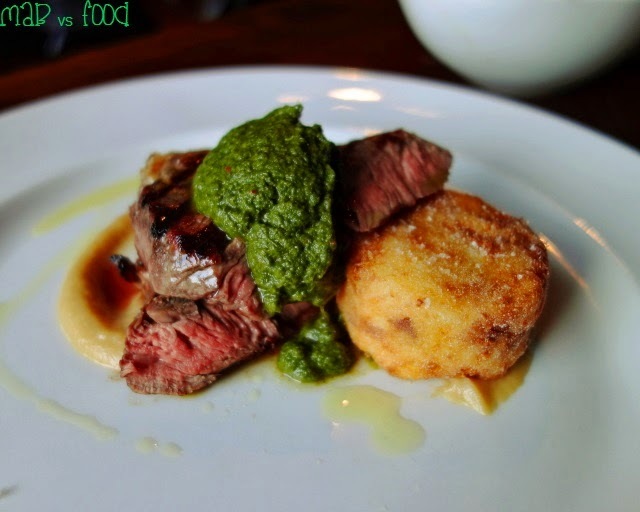 The onion puree had a subtle sweetness, whilst the chimichurri was punchy and spicy. My wife had tomato risotto, as this was the sole vegetarian main option. More tomato, basil and cheese so not much more needs to be said about the flavours. I love corn on the cob slathered with melted butter, so I ordered some as a side. 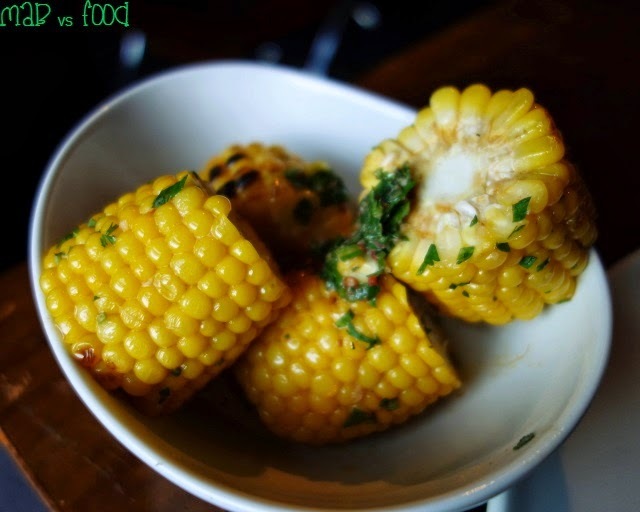 The corn kernels were crisp, juicy and sweet.The butter had an extra kick of spice from chipotle. Picada has a simple offering for desserts with a chocolate mousse tart, creme brulee tart, churros and affogato. We decided to share the churros and the creme brulee tart. 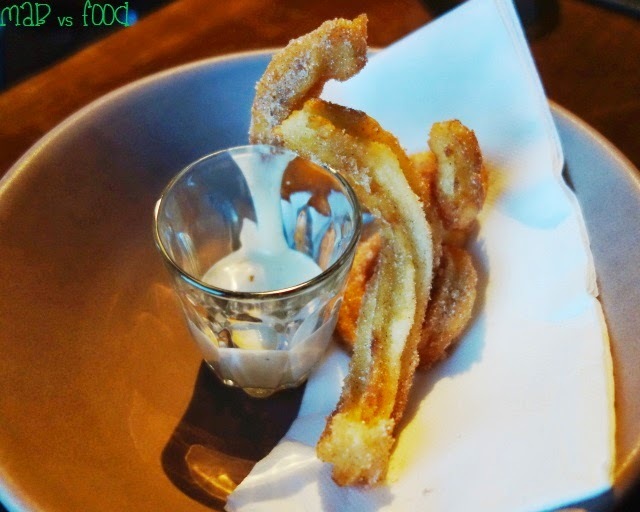 The churros were the first thing that jumped out at me when I scanned the dessert menu. I enjoyed Picada's churros. They were crisp, not doughy and didn't taste oily. The dulche de leche, a sweetened, caramelised milk dip, was just addictive. Picada's creme brulee tart is not your traditional creme brulee. It was essentially vanilla cream set inside a tart case and topped with shards of toffee. 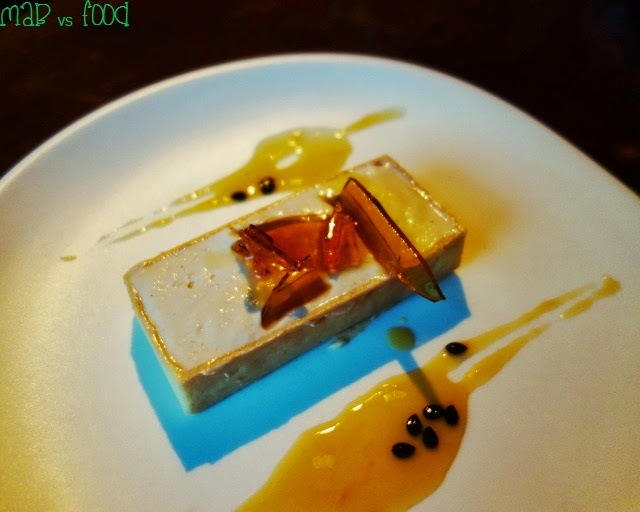 The acidity of the passion fruit puree went well with the creaminess of the tart. After an enjoyable meal, we asked for the bill knowing that we had to rush for the ferry home. If we missed this one, we would have had to wait another hour! As we were about to settle the bill, our waitress rushed over to our table and tried to add the cost of the burrata entree to our bill, supposedly because this was one of the dishes excluded from the Ouffer deal. This was certainly news to us and we were definitely not told this. After she consulted a manager about this, luckily they decided not add this to our bill. 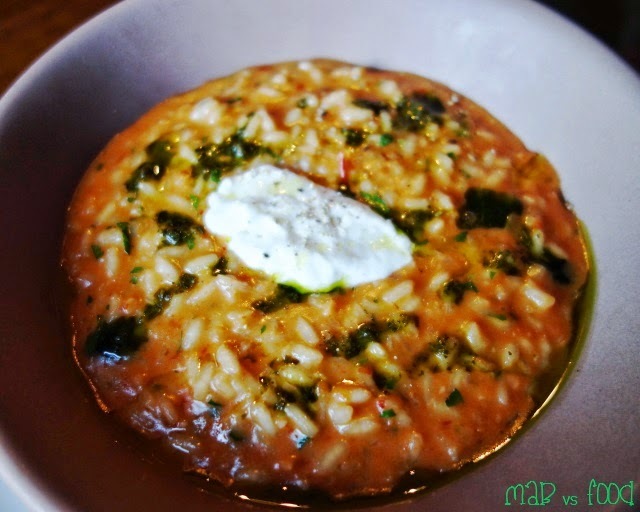 So just a little mishap, and perhaps miscommunication (I checked my voucher later and it did not list the burrata as one of the exclusions); hopefully these sorts of issues will get ironed out, because I am more than happy for a return visit to Picada. 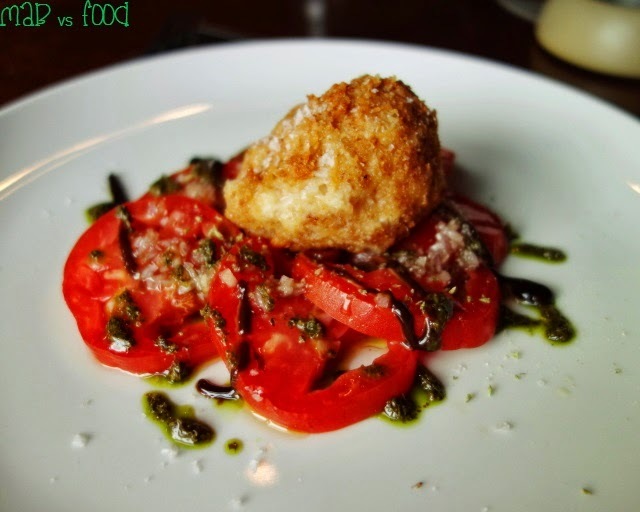 Highlight: Deep fried goodness in the form of burrata and papa rellena. Lowlight: Some repetition of flavours in several of the dishes, especially tomato and basil.